I ended up using the theme (flowers) and the color combo of Stampin' Up Cherry Cobbler, Tip Top Taupe & Crushed Curry. All products used are from Stampin' Up! including the recycled corrugated cardboard I tore from a Stampin' Up! shipping box. I somewhat flattened the corrugated cardboard by running it through my Big Shot between the cutting plates. Then I randomly rubbed Versamark on it and embossed those areas with White Stampin' Emboss powder. I added water & color randomly on the tag before stamping the flower image from Remarkable You on it with Tip Top Taupe and the speckles with Crushed Curry using my most used stamp from the Gorgeous Grunge stamp set. I then used a barely wet brush to paint the flower with Cherry Cobbler & Crushed Curry. I used the White Signo gel pen to add a few highlights to the flower. I dyed the Whisper White Seam Binding Ribbon with Crushed Curry ink. All in all, I am happy the mixed media look of this card. Click on the image above to check out the new Weekly Deals! Save up to 25% on the items below. There are also still some amazing items on the clearance rack. I hope you enjoyed the project. Please use the hostess code shown in the top right corner when ordering online, unless your order will total $150 before shipping & tax. At that point, you become your own hostess and get all the rewards! Please keep in mind if you choose "no contact" from the demonstrator, I'm unable to even send you a thank you note for your order...That's right, I'm not even able to see your name. 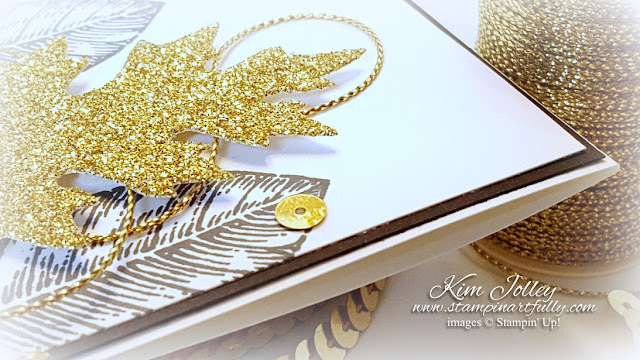 You may just be starting the blog hop or may have come from Jennifer Michalski's Stamping Serenity blog, number 17 on the Pals Hop. If you get off track at any time, the full lineup below will help you move along from blog to blog so you see all the projects. I have a tip to share. 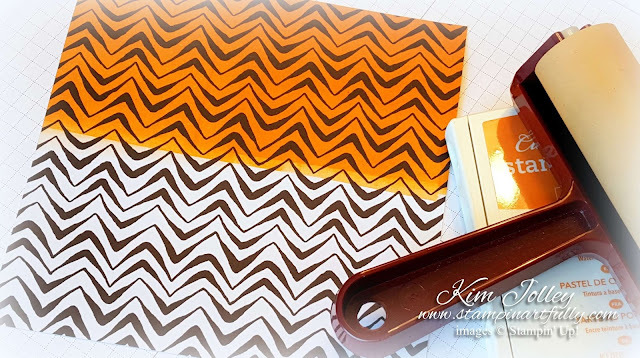 As I was getting ready to make this project, I realized I didn't have any black & orange DSP (designer series paper). However, I did have some black & white DSP from the Go Wild Designer Series Paper Stack, which I brayered with Pumpkin Pie ink to make the paper used on this project. This technique will work with just about any ink color. Don't you just love this Go Wild DSP? 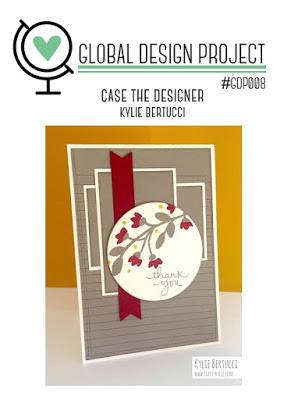 The 6x6 size is so easy to work with and perfect for so many projects. Don't forget to do a bit of stamping on the inside of the card to pull the look together. The little wispy black pieces are just narrow strips of cardstock I curled with my bone folder. The matching envelope liner really completes the ensemble. Full product list below blog lineup. The next stop is Becky Volp's Ink Blossom blog, number 19 on the Pals Blog Hop! Thanks for visiting; I hope to see you on next month’s Pals Hop! 6. 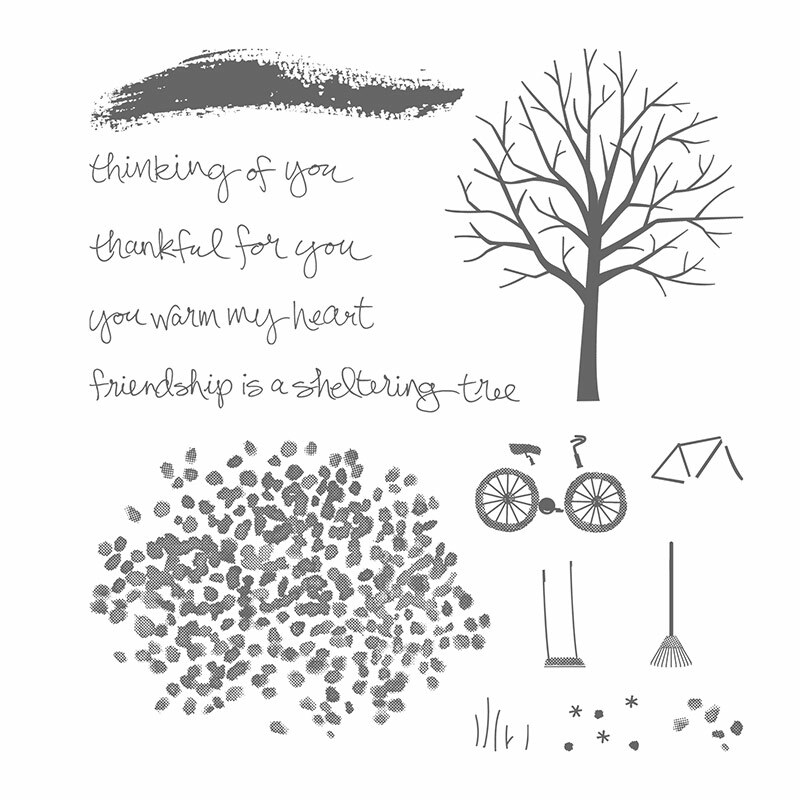 Karen Hallam at Karen's Stampin' Habit! I hope you enjoyed this blog hop project. Please use the hostess code shown in the top right corner when ordering online, unless your order will total $150 before shipping & tax. At that point, you become your own hostess and get all the rewards! Please keep in mind if you choose "no contact" from the demonstrator, I'm unable to even send you a thank you note for your order...That's right, I'm not even able to see your name. I love gold and all things that are glittery gold. That's what made this project one of my favorites so far this season. I did see a layout like this on Pinterest, but cannot recall who the original artist was. (her's was in colors, not gold & neutrals) All products are Stampin' Up! 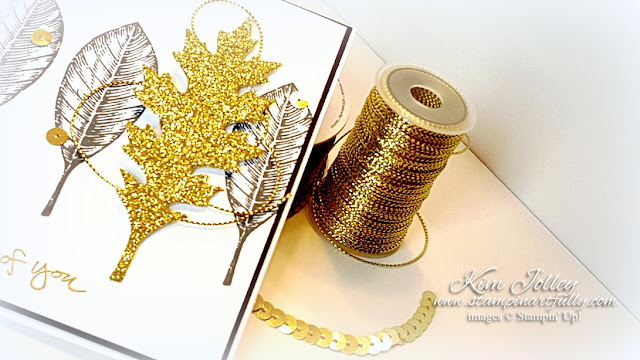 Look how this simple layout turns to "wow" with the added touches of gold! 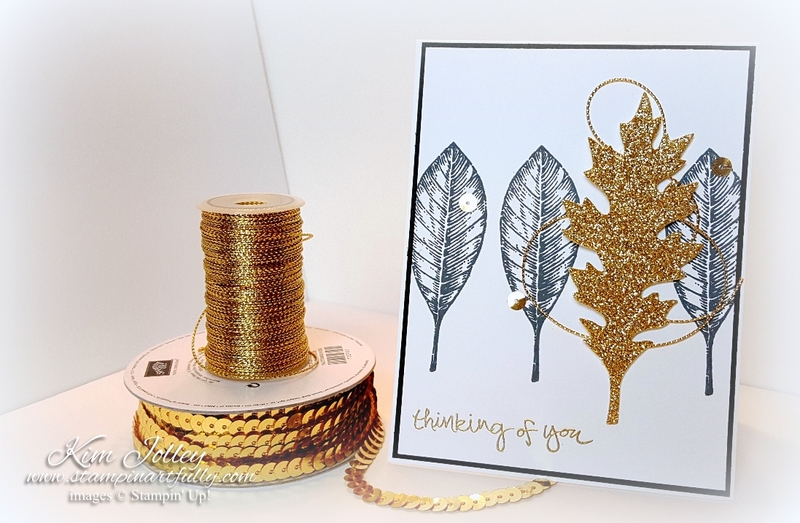 Look how the new gold cord just curls up perfectly under the leaf, adding lovely dimension to this project. 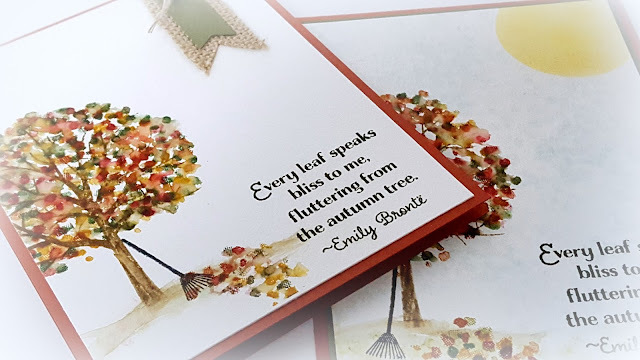 The sentiment is from the Sheltering Tree stamp set, but you could use just about anything in its place or nothing at all. The design speaks for itself. I adore this time of year. The colors that nature produces are some of my favorites to work with. 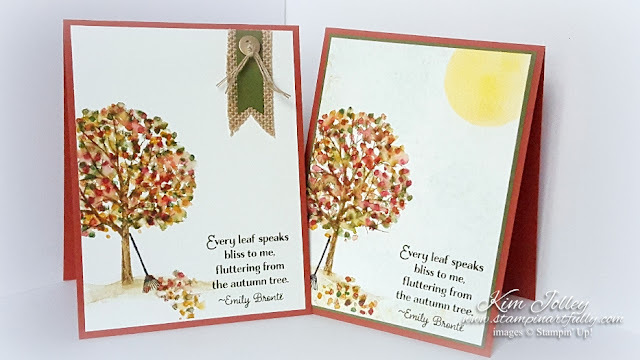 I was in the mood for fall trees & leaves today, so I came up with two projects. 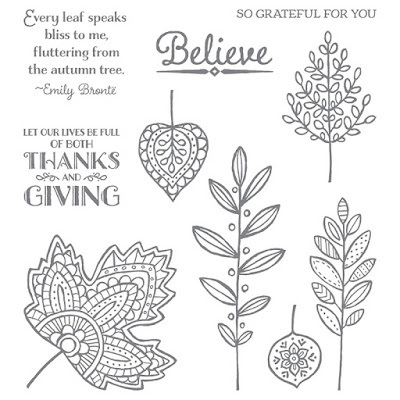 All supplies used are Stampin' Up! There is a tiny set of leaves in the Sheltering Tree set. 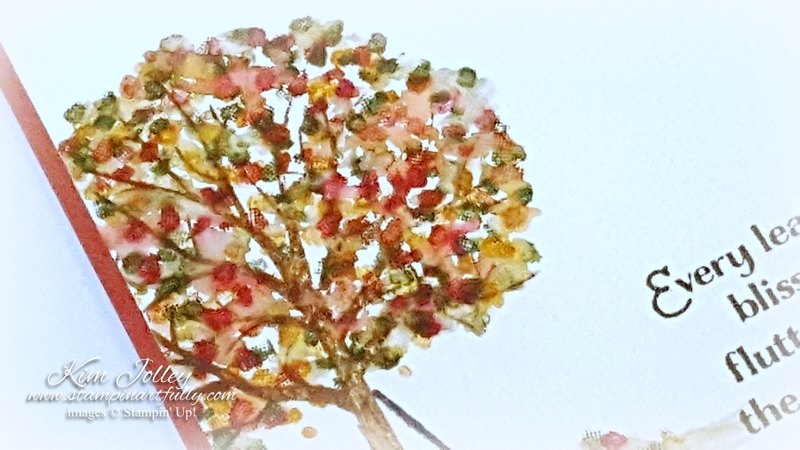 I used that stamp to stamp the leaves in the many colors I used. It's the image in the lower right corner below. It is hard to tell, but I used the large stamp on the lower left to create a very pale blue sky on the card on the right. In order to make the leaves look soft like they do, all images were stamped on watercolor paper, then I "dabbed" at the leaves with my Aqua painter to soften and blend the colors. I love the look! The sentiment is from the brand new stamp set called Lighthearted Leaves.